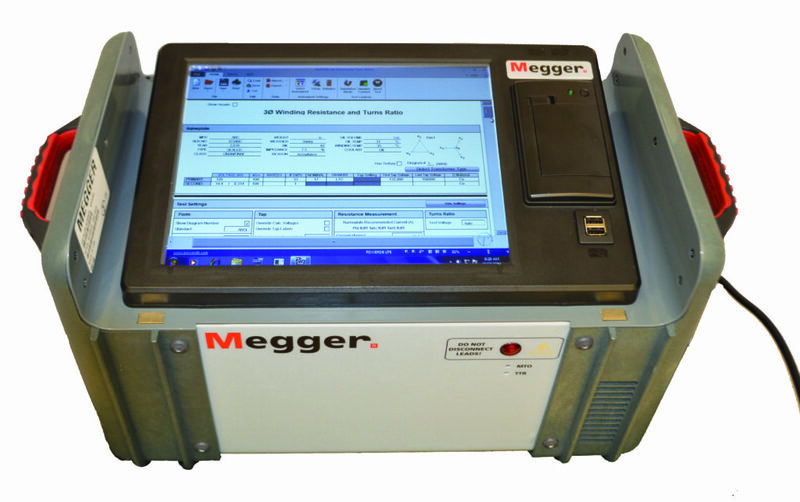 The Megger MWA3 series transformer winding analyser is designed to perform transformer ratio and winding resistance testing in one box, quickly and efficiently. It is an advanced three-phase portable transformer test system which reduces set-up time, increases job-site safety, and delivers improved productivity compared to individual instrument testing. The unit’s light weight (15 kg) and small size (280 x 280 x 460 mm) makes it 40% lighter to carry and offers 55% more space in vehicles than other equipment on the market today. The ease and convenience of using the same set of test leads eliminates the need for frequent ladder trips and mistakes with lead connections from one lead set to another; one set of leads equals one ladder climb. The unit provides complete ratio, phase and winding resistance measurements for a three-phase transformer. All ratio and winding resistance tests are performed in one instrument with one three-phase lead-set connection. The post Transformer ratio and winding resistance tester appeared first on EE Publishers.